"Peaceful Island" maybe the right translation for Amanpulo, Aman resorts' tropical retreat in the Philippines, but "Lotus Eating Land" may be more accurate. The lads of ancient Greece certainly must have had Amanpulo in mind when they described the lotus plant as inducing "luxurious dreaminess and distaste for the active life" - it's exactly the effect this Filipino paradise has on its guests. Fringing the shores of its own tiny island, (Pamalican) a mere 60-minute flight by private charter from the chaos of Manila, this architecturally spectacular resort has just 40 'casitas' designed by celebrated Filipino architect Francisco Mañosa. You can choose one high on the hillside with fantasy views of sea and sand, waving palms and bright turquoise fishing boats, or a casita nestling into the hillside itself. Beachcombers will want the seashore pavilions, literally half- a-dozen paces from the salt white sand. The casitas themselves have been adapted from the relaxed, traditional Filipino bahay kubo houses, although for those who must take their work with them, there's a desk with a stunning view of this tropical world, while enormous dressing rooms are divided into "his" and "her" areas so there'll be no squabbles about space. Where possible, Mañosa has chosen to use local materials, tables of coconut shell, Cebu marble and lots of rattan and hardwoods. The baths are of the sinful variety, sunken and enormous, and I spent some time lolling about in mine in a sea of fragrant bath gel coloured exactly the same aquamarine as lapping waves just outside. For the ultimate indulgence The Luxury Travel Bible suggests renting one of the private villas located just a few sandy steps from the sea. There are eight 4-bedroom Villas, two 2-bedroom Villas and one 1-bedroom Villa. Each has a private swimming pool, separate bedrooms, living and dining pavilions. All villas include a cook, maid, and a buggy. Where ever you choose to stay there is little to do here except enjoy the water life. Snorkelling, sailing, scuba diving under the watchful eyes of trained dive masters (full dive courses are available) or the occasional languid game of tennis make the soothing pattern of your days. 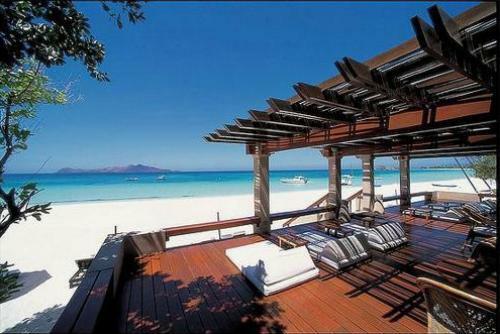 Amanpulo is definitely an island where you'll want to take along a good book, or a friend who's read one. The baths are of the SINFUL variety, sunken and enormous, I spent some time lolling about in a sea of fragrant bath gel coloured exactly the same AQUAMARINE as the lapping waves outside. One of the nicest things about Amanpulo is that, on arrival, guests are given their own little golf cart in which they can explore the island, and whiz themselves up to dinner in the airy dining pavilion. The outdoor terrace is set with piedra China (China stone) from Manila Bay. Chinese ships once used the stones as ballast, as did Spanish galleons sailing to the Philippines in the 1600s. Local fishermen bringall kinds of unusual seafood, which the Aman chefs turn them into original, light dishes perfectly suited to the tropics - nothing too classical, no heavy sauces. Lots of fruit, ice-creams and sherbets. Filipino dishes are combination of Spanish influences and local ingredients and often relate to Thai; for instance, ginataang, which is shrimp, chicken, perhaps fish, simmered in coconut milk and garlic, chilli and ginger. Nathan Thompson and Ian Gilmour, a down-to-earth pair of lighting geniuses and Lighting arrangers for such luminaries as Dame Kin Te Kanawa, Men at Work, Cher and Elton John, have wrought magic on the island. Up in the dining pavilion, tall, cream market umbrellas puddle shade in the white heat of afternoons, metamorphosising into subtle pools of starshine at night. Amanpulo is certainly doing much right, from utilising eco-conscious desalination, to presenting lunch-time meals in smooth cream and brown bowls made from the ashes of Mt Pinatuba's last mighty explosion. The casitas are sybaritic, the staff engaging and willing. And me? I cast myself adrift on the surface of this beautiful sea and think of nothing.